These Omni joint components are for manual drilling, using a special Omni Joint jig. Units are split between corner joint units for the corners of a frame or sash, and central joint units for mullions or rails. This Omni Joint corner unit is designed to work with manual drilling, assisted by a jig. This product is for 1-¾" softwood doors. Rail width should be less than 4-¾". Panel or glass thickness should be less than 1". This Omni Joint corner unit is designed to work with manual drilling with a jig. This product is for 1-¾" doors in hardwood species, or 2-¼" in softwood. Rail width should be less than 4-¾". Panel or glass thickness should be more than 1". This Omni Joint corner unit is designed to work with manual drilling with jigs. This product is for 2-¼" hardwood doors. Rail width should be more than 4-¾". Panel or glass thickness should be more than 1". 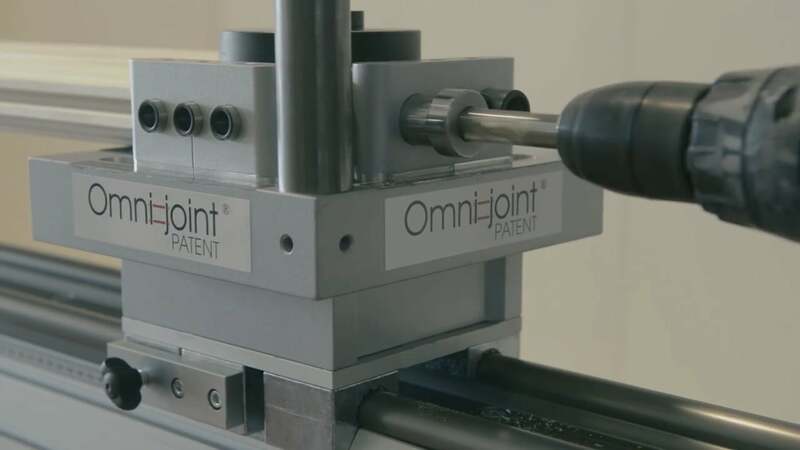 This Omni Joint Central Joint unit is designed to work with both CNC and manual drilling with jigs. For any internal crosspieces of your door, like rails or mullions, two of these are required, one at each end, to be joined in place. Door Thickness 1-¾" 1-¾" 2-¼" 2-¼""
Rail Width Less than 4-¾" Less than 4-¾" Less than 4-¾" More than 4-¾"
Panel/Glass Thickness Less than 1" More than 1" More than 1" More than 1"
Click here to learn the basics about the Omni Joint joinery system. These jigs align your workpiece for perfect fit for the OmniJoint mechanical fastening system. These Omni Joint mechanical components are designed to be used with CNC machining.